Special online resources made specifically to help our Salvation Army clients reach the most donors and get the most out of their fundraising opportunities. Subscribe to get straightforward thoughts and insights every month. At any fundraising conference you attend, presenters will fire up their presentation by sharing an abundance of numbers to back up their success. Welcome to the world of fundraising data! Fundraising is naturally accountable to the realities of bank balances and budgeting. Every executive director and finance director needs a reasonably accurate prediction of revenue to help them guide decision-making. What makes fundraising complicated, frustrating, and exhilarating is the donor variable. People are inherently complicated, and their behavior is fluid — changing over time and in response to actions that influence their decision. (That’s why it’s important to learn about your donors’ motivations.) The good news? People are similar enough that, on a large scale (say 10,000 people), you can begin to organize donors into similar groups based on their behavior. For example, donors who have given for three or more years are more likely to give again. The other variable — how much and how often a donor gives — enables an organization to prioritize spending, and develop strategies that maximize the value of a donor’s giving. Available Donors — the number of donors who had given in previous years. Active Donors — the number of donors active in the current year. Retention Rate — the number of donors who gave again the next year (often based on a fiscal year for planning purposes). Average Gift — the average gift amount of all of the donors analyzed. Frequency — the number of individual gifts a donor made in one year. Use these patterns of giving, plus donor lifecycles, to make important decisions about how your charity should spend money on fundraising. A lot of external variables can influence the results. But a well-developed plan, with a clear goal informed by analysis, will produce results over time and poise your charity for success when challenges arise. This is an excerpt from our newly published Fundraising Field Guide. Fundraisers have long sought to find and cultivate those with heroic human hearts who want to turn their compassion into action. Along the way, fundraisers have also learned lessons, honed skills, and crafted techniques that — in the end — are framed by basic human behaviors and motivations. 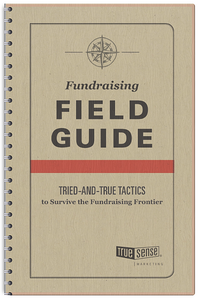 Get your copy of the complete compendium of tried-and-true tactics for conquering the fundraising frontier, written by TrueSense Marketing’s fundraising experts.